While other manufacturers have bolstered their lower end compact system camera offerings, Sony has gone the other way and introduced a semi professional flagship model in the Alpha series Sony NEX-7. This contender is notable for being one of only two current models, the other being the robust Nikon V1, to include an integral viewfinder alongside a regular LCD. Just like on a DSLR you have a choice of two 'windows' via which to compose shots. Additionally, Sony offers a very high, competition-trouncing effective resolution of 24.3 megapixels. This is delivered via a physically large APS-C sensor as also found on DSLRs. Most rival interchangeable lens compacts offer sensors that are only slightly larger than those found in regular pocket point and shoots; a bigger chip in theory equals better quality pictures and video. The knock-on effect however is lenses for Sony's NEX system are physically larger than the competition too, which won't be to everyone's taste. Neither will be the eye-watering £1,129 price, though that includes the body (£999 alone) plus jack-of-all-trades 18-55mm E-mount lens offering the 35mm equivalent of 27-82.5mm, or a 3x zoom. The lens features built-in stabilisation – worth having as anti shake isn't built into the NEX-7 body. 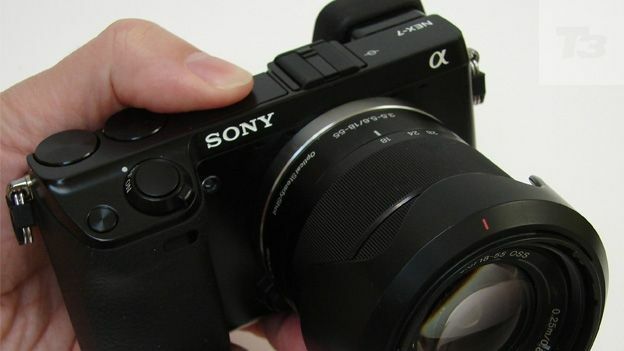 In common with NEX predecessors the body design of the Sony NEX-7 is minimalist to the extent that it almost looks unfinished. This is accentuated by the fact it includes a total of three unmarked buttons and two unspecified dials, latter of which can provide instant access to shutter speed, ISO and exposure settings when shooting in one of the creative modes. The control layout is positioned so that it falls readily under forefinger and thumb of the right hand. Rather too readily on occasion: we managed to accidentally hit the video record button positioned beneath the far right dial when otherwise attempting to adjust exposure. Up top we get the familiar on/off switch encircling the shutter release button, a set-up which echoes a digital SLR, plus small buttons for playback and flash activation that we might expect on a pocket compact. Integral flash is of the neat pop-up variety, while a top plate hot shoe is provided for accessories. On the back plate, a scroll wheel that likewise allows the user to zoom through the likes of ISO options can also be used to tab through settings at a more considered pace with a gentle edge press, while the function of the two buttons flanking it only becomes apparent with the camera is switched on. These button functions also change dependant on which settings are selected. Though certain operational aspects are commonplace then, like on all NEX models, you'll probably want a short period of familiarisation before you start shooting in earnest. As noted at the start, there's the unusual choice here of composing shots and videos via two screens. There's the eye catching widescreen format 3-inch, 921k-dot resolution LCD that takes up two thirds of the Sony NEX-7's backplate, plus the smaller OLED technology viewfinder window with 2,359k dot resolution and prominent eyecup located top left of it. The larger LCD screen isn't a touch screen yet is notable for the fact that it is angle adjustable, so can be tilted up or down to better enable high or low angle shots respectively, or aid visibility in direct sunlight. The alternative is the smaller viewfinder window – which Sony calls its 'Tru-Finder'. It's electronic, as opposed to optical, so only comes into play when the camera is switched on; you can't remove the lens cap and line up the shot mwithout the camera activated. An eye sensor cleverly switches on this EVF as it detects the user's pupil, thus seamlessly allowing the photographer to transfer their gaze from screen to the other without any button pressing. With a 100% field of view and near like-for-like 1.09x magnification factor, its smaller size means that it suffers in comparison to the larger screen below, most noticeably when shooting in low light. Otherwise it's nice to have both options – but of course there's that premium to pay. The Sony NEX-7 comes bundled with a NP-FW50 lithium ion rechargeable battery out of the box, plus a dedicated mains charger to get things up and running. In lasting approximately 335 shots from a full charge, the NEX-7 gives an acceptable performance that compares well with close rivals whilst not being especially standout. Image quality is the NEX-7's chief selling point and stunningly, despite the almost impossible hype in the build up to its release, with unadulterated Raw and compressed JPEG file formats or combination of both at our disposal, it doesn't disappoint. Attention-drawing shallow depth of field effects are possible for portraiture, even using the catch-all kit zoom. And though grain is visible at top whack ISO16000 light sensitivity setting, it's almost attractively fine. The Sony furthermore offers up to 10 frames per second stills capture for action photographers,plus the company's regular panoramic modes, including 3D option viewable only on suitably equipped TV, for landscape photographers. For low light shooting, a comprehensive ISO range betters all but the highest end digital SLR in stretching from ISO100 to a see-in-the-dark ISO16,000. Yes the price tag is high, but you get a lot for it. Digital filmmakers will enjoy having both Full HD 1920x1080 pixels capture at a choice of frame rates, including 50 frames which when output at 25fps provides a cinematic quality, plus a less bulky alternative to the industry standard Canon EOS 5D MKII at their disposal. The 24.3 megapixel, 1920x1080 video shooting, APS-C sensor-incorporating Sony NEX-7 is the priciest interchangeable lens compact to date. Luckily for Sony then it's arguably the best, with a performance that should satisfy the semi pro. Even if it does fall short of fulfilling the original 'DSLR like quality in compact camera form' brief by being too large to fit even in a jacket pocket with 3x zoom attached. We enjoyed the angle adjustable LCD and it's one of a rare few to feature an electronic viewfinder built-in rather than just available as an optional extra (required for Olympus and Panasonic ranges). If high resolution is your top wish, you might like to investigate the rival Samsung NX200, whilst the Nikon V1 is otherwise Sony's closest competition with its own integral viewfinder. Though omitting built-in anti shake, the Sony Cyber-Shot NEX-7 incorporates just about all that anyone could want from a compact system camera – including high resolution stills and video with stereo sound, large sensor, decent range of compatible optics, adjustable LCD and separate OLED viewfinder. The pro-level price is the only thing that sticks in the throat.